The rosters of many Euro 2012 teams are a melting pot - one that modern-day Europe should start getting used to. On one level, the Nike ad pays homage to global football’s collective memory — via a parade of iconic hairstyles, all of which Mario Balotelli turns down before settling on his own trademark fauxhawk. Anyone watching the game for the past two decades knows that the jheri curl belongs to the inimitable Ronaldinho, while that ridiculous fuzzy mullet is the barnet of current Brazilian wonderboy Neymar. The idiotic triangle was a spectacularly bad idea sported by Brazilian striker Ronaldo at the ’98 World Cup, while the explosive blonde afro belongs to the brilliant Colombian midfielder Carlos Valderrama. By their haircuts, ye shall know them. But there’s more to it than that. When Mamadou Sakho brushes past Mario Balotelli and says, “See you on the pitch”, it’s quite conceivable (if Sakho’s lapse in form hadn’t seen him dropped from the national squad) that the occasion for such an encounter could be France vs. Italy. It speaks volumes that a Nike ad released in the buildup to Euro 2012 can set rising stars of France and Italy in that most iconic of urban black settings, the barber shop. It wouldn’t raise eyebrows in America, of course, because the U.S. is a nation of immigrants ruled by a man of mixed race, where the idea of diversity in the representation of America’s national “self” is uncontroversial. But Europe has spent decades locked in political turmoil over boundaries of identity, race and nationality, many of them raging as fiercely as ever. And those struggles are inevitably reflected in football, although the game on balance has been at the cutting edge of forcing the continent to come to terms with the sorts of changes that Norwegian shooter Anders Breivik was willing to kill in order to reverse. There’s nothing remarkable about Sakho representing France, of course — the majority of its squad over the past three World Cups have been of African, Caribbean and Arab origin. And in some way, it’s been something of an indicator of the state of France’s identity conversation. 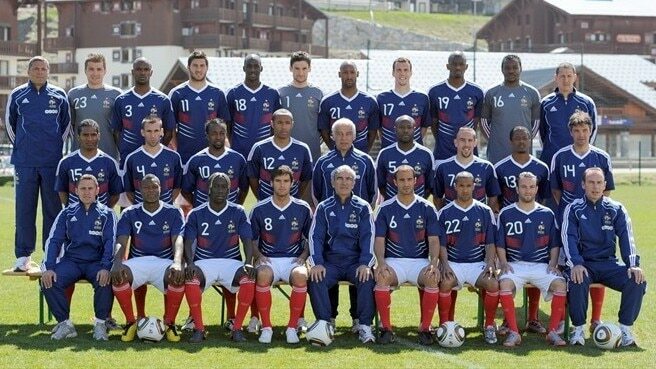 The team that contested the 1998 World Cup, on home soil, included so many players of color that Jean Marie Le Pen, leader of the anti-immigrant National Front, complained that it was “not a real French team.” But France was ecstatic in its adulation of a team that, against the odds, won France’s first and only World Cup. “Black, Blanc, Beur” was the slogan of salutation of that triumph, meaning “black, white, Arab” — a celebration of the diversity of a team that had brought glory to France. It’s leader and perhaps the most gifted player, worldwide, of his generation, Zinedine Zidane, was hailed by many as a symbol of a new France, given the country’s highest medal, the Legion D’Honneur, and even touted as a possible future president by some giddy fans. But sons of Algerian janitors don’t typically become presidents of France despite the country’s principles of Liberte, Egalite, Fraternite. In fact, they’re not particularly integrated into French society. But France’s fraught politics of immigration began to impinge on the game during the ensuing 12 years,with violent clashes in the ghetto suburbs around Paris, France’s national anthem being booed by crowds of young Algerian- and Tunisian-Frenchmen in international games, and not being sung by all the players on the team, either. Then came the meltdown of 2010, when a team of mostly black players at the World Cup in South Africa clashed publicly with its coach — even going on strike in solidarity striker Nicolas Anelka, sent home for reportedly calling coach Raymond Domenech names that most fans would have agreed with — and failing to win a single game. Still, half or more of the France squad for Euro 2012 will be players whose origins lie in sub-Saharan Africa and the Maghreb; so, too, the Dutch (although their players’ colonial origins also include Indonesia and Suriname). Around one third of the England squad are players of color, mostly of Caribbean heritage — although English football, too, has faced squalid moments of racism during its history, for example in 1994 when the Guardian reported being told by a former England manager that he’d been instructed, by the national federation, to avoid picking “too many black players” for England during his tenure. Germany is another European side wildly more diverse today than even a decade ago, its starting lineup today typically featuring players whose parents are Nigerian, Turkish, Moroccan, Polish and Spanish. Portugal’s national side has long featured a handful of Brazilians (think Deco, or today, the Real Madrid defender Pepe) and a couple whose whose roots lie in Lusophone Africa (from the great Eusebio in ’66 to the likes of Nani, today). And Sweden, long one of the more open European countries for refugees, has often fielded players of color, and its current squad includes two ethnic Albanians (one of them being the fearsome Inter Milan striker Zlatan Ibrahimovic) and an Iranian. Then, the ranks of immigrant-rooted players thins out substantially among the Euro 2012 competitors. Denmark fields one player born in Cote D’IVoire, Croatia’s former Arsenal striker Eduardo is Brazilian; the Czech squad includes a locally-born player of Ethiopian parentage. Greece has a German-born player whose mother was Uruguayan, and one born in Albania. But there are a number of teams with no immigrant players — Ukraine, Russia (well, they do include an ethnic Tatar and a player from Ingushetia), the Republic of Ireland, and Poland — the latter, curiously enough having provided a pleasant surprise, back in 2000, by naturalizing the Nigerian strike Emmanuel Olisadebe, who had come to Poland to play for Polonia Warszawa, and picking him for the national side. They also, until recently, fielded a Brazilian striker, Roger Guerreiro. And then, of course, there’s Italy. Mario Balotelli is the first black player to represent the Azurri, and he’s pretty much the exception that proves the rule. Italy doesn’t make much of an effort to pick immigrants, beyond Argentinians whose names show their Italian heritage. The other exceptions in the current squad are young defender Angelo Ogbonna, whose father is Nigerian, and the brilliant AC Milan center-back Tiago Motta, who is Brazilian. But as a rule, the dozens of foreign players who turn out for Italian clubs every week are viewed simply as temporary sojourners. Balotelli, of course, has a unique life story, being given up for adoption by his Ghanaian parents who, struggling as migrants in Italy could not afford the cost of treating a complex medical problem he faced as a child — he was adopted by white Italian parents, but grew up in a society riddled with racism, which has dogged much of his playing career. Indeed, he still finds himself racially abused and taunted by a section of Italy fans when he takes the field for the national side. The racism may be more pronounced in Ukrainian football. Their national squad has no immigrants, even though the domestic league is dominated by foreigners — Dinamo Kiev’s squad has five Brazilians, three Nigerians and a Morrocan; Shakhtar Donetsk has 8 Brazilians (9 if Eduardo is counted) and a Nigerian. Metallist Kharkiv has just four Brazilians, but six Argentinians and a Senegalese. And so on. If that’s how the national team coach expresses himself, it ought to be no wonder that the families of black players from England are fearful about taking their chances with the neo-Nazis of Ukraine. Spanish football has had to tackle a massive problem of racism on the terraces, over the years, against which the continental federation, UEFA, has taken a strong stand. But the same things have been happening in Italy, and sometimes even in Holland. Two very high profile cases of alleged racial abuse made headlines for weeks during the English league season: Liverpool’s Luis Suarez received an eight-match ban after allegedly racially taunting Manchester United’s Patrice Evra during a game, while Chelsea and England defender John Terry faces trial in a magistrate’s court on charges of racist abuse against Queens Park Rangers’ Anton Ferdinand after being caught on camera allegedly calling Ferdinand a “black c**t”. But let’s be clear, though: The reason football gets up the noses of the haters and the Nazis is simply that it provides a spectacle of an egalitarian society where men are judged not on the color of their skin (or eyes, or hairdos, for that matter) but on the quality of their crosses and shots, the strength and timing of their tackles, the weight and arc of their passes, the timing of their jumps and runs, the intelligence and guile of their movement, and their willingness to run and fight for their teammates. On the pitch, at least, football represents a post-racial Europe that is fighting to emerge. So more power to you, Theo and Alex, Mario and Zlatan, Samir and Karim and the rest — go annoy the hell out of those Ukrainian neo-Nazis! Show them a Europe they don’t want to see, but will be better off getting used to.